Previous biochemical studies have demonstrated that synergy between non-nucleoside reverse transcriptase (RT) inhibitors (NNRTI) and nucleoside RT inhibitors (NRTIs) is due to inhibition by the NNRTI of the rate at which HIV-1 RT facilitates ATP-mediated excision of NRTIs from chain-terminated template/primers (T/P). However, these studies did not take into account the possible effects of NNRTI on the ribonuclease H (RNase H) activity of RT, despite recent evidence that suggests an important role for this activity in the NRTI excision phenotype. Accordingly, in this study, we compared the ability of efavirenz to inhibit the incorporation and excision of zidovudine (AZT) by HIV-1 RT using DNA/DNA and RNA/DNA T/Ps that were identical in sequence. Whereas IC50 values for the inhibition of AZT-triphosphate incorporation by efavirenz were essentially similar for both DNA/DNA and RNA/DNA T/P, a 19-fold difference in IC50 was observed between the AZT-monophosphate excision reactions, the RNA/DNA T/P substrate being significantly more sensitive to inhibition. Analysis of the RNase H cleavage events generated during ATP-mediated excision reactions demonstrated that efavirenz dramatically increased the rate of appearance of a secondary cleavage product that decreased the T/P duplex length to only 10 nucleotides. Studies designed to delineate the relationship between T/P duplex length and efficiency of AZT excision demonstrated that RT could not efficiently unblock chain-terminated T/P if the RNA/DNA duplex length was less than 12 nucleotides. Taken together, these results highlight an important role for RNase H activity in the NRTI excision phenotype and in the mechanism of synergy between NNRTI and NRTI. Reverse transcriptase (RT) facilitates the conversion of the HIV-1 single-stranded RNA genome into double-stranded DNA. HIV-1 RT is a multifunctional enzyme that exhibits RNA- and DNA-dependent DNA polymerase activity and ribonuclease (RNase) H activity. Because of its crucial role in viral replication, RT is a major target for chemotherapeutic intervention. To date, two distinct groups of RT inhibitors have been approved by the US Food and Drug Administration for the treatment of HIV-1 infection. These include 1) the nucleoside/nucleotide RT inhibitors (NRTI) that bind to the active site of RT and act as competitive inhibitors of DNA polymerization and 2) the non-nucleoside RT inhibitors (NNRTI) that bind to a nonactive site pocket in HIV-1 RT (termed the NNRTI-binding pocket) and act as allosteric inhibitors of DNA polymerization. The USA Panel of the International AIDS Society recommends combination therapies that comprise an NNRTI or protease inhibitor boosted with low-dose ritonavir, each combined with two NRTIs for the treatment of adult HIV infection (Hammer et al., 2006). In this regard, the efficacy of regimens that include both an NNRTI and NRTIs may be explained, in part, by the observed synergistic interactions between these two classes of drugs (Richman et al., 1991; Chong et al., 1994; Pauwels et al., 1994; Merrill et al., 1996; Borkow et al., 1999; Maga et al., 2000; King et al., 2002). Biochemical studies designed to address the mechanistic basis of synergy between NRTIs and NNRTIs have proposed a general mechanism in which the NNRTI inhibits the ATP-dependent removal of NRTIs from primer termini, thus prolonging the effect of chain-termination (Borkow et al., 1999; Basavapathruni et al., 2004; Cruchaga et al., 2005). Pre-steady-state kinetic studies further demonstrated that NNRTIs inhibit the ability of RT to unblock chain-terminated template/primers (T/P) by negatively affecting both affinity of ATP for RT and the rate of the chemical step in the excision reaction (Basavapathruni et al., 2004). However, these studies were carried out using DNA/DNA T/P only and, as such, they ignored the potential contribution of the enzyme's RNase H activity in the NRTI excision phenotype. Inhibition of RT-mediated AZT-TP incorporation and AZT-MP excision on RNA/DNA and DNA/DNA T/P by efavirenz. A, sequences of RNA and DNA templates and DNA primer used in all experiments. In the ATP-mediated excision assays, the pr26 primer was chain-terminated with AZT-MP (designated as Z). B, representative gel analysis of AZT-MP excision reaction carried out on RNA/DNA or DNA/DNA T/P in the absence and presence of varying concentrations of efavirenz (0-300 nM). C, graph of inhibition of AZT-MP excision by efavirenz on RNA/DNA T/P (○) and DNA/DNA T/P (•) from data in B. IC50 values determined from this isotherm were 11.9 and 100.7 nM for the RNA/DNA and DNA/DNA T/P, respectively. D, HIV-1 RT AZT-MP excision isotherms from RNA/DNA T/P (○) and DNA/DNA T/P (•) in the absence of inhibitor. The apparent rates of AZT-MP excision were calculated to be 0.067 ± 0.005 min-1 and 0.045 ± 0.002 min-1 for DNA/DNA and RNA/DNA T/P, respectively. The burst amplitudes (total amount of product excised at an infinite time point) were 84 and 45% for the DNA/DNA and RNA/DNA T/P, respectively. E, IC50 values for the inhibition of AZT-TP incorporation and AZT-MP excision by efavirenz under single-turnover conditions. The concentrations of efavirenz used in the incorporation assays were 5, 10, 20, 30, 50, 100, 150, 250, and 500 nM. The concentrations of efavirenz used in the excision assays were 2, 5, 10, 30, 50, and 100 nM and 25, 50, 100, 150, 200, and 500 nM for the RNA/DNA and DNA/DNA T/P, respectively. The calculated IC50 values for incorporation of AZT-TP were 19.6 ± 8.5 and 10.2 ± 4.0 nM for the DNA/DNA and RNA/DNA T/P, respectively. The calculated IC50 values for ATP-mediated excision of AZT-MP were 108.1 ± 32.3 and 5.8 ± 1.1 nM for the same two substrates, respectively. The difference between these two values was found to be statistically significant (p < 0.005). Nikolenko et al. (2005) reported that a balance between nucleotide excision and template RNA degradation plays an important role in NRTI resistance. This group elegantly demonstrated that any mutation (and by inference drug) that affects the enzyme's RNase H activity also affects its ability to excise chain-terminating nucleotides. In this regard, several studies have reported that NNRTIs can modulate the RNase H activity of RT (Gopalakrishnan and Benkovic, 1994; Palaniappan et al., 1995; Shaw-Reid et al., 2005; Hang et al., 2007). In light of these findings, we were interested to compare and contrast the ability of NNRTIs to inhibit the ability of RT to unblock chain-terminated primers using both RNA/DNA and DNA/DNA T/P substrates. The results of these studies are described below. Materials. HIV-1 RT was overexpressed as an N-terminal hexahistidine fusion protein and purified to homogeneity as described previously (Le Grice et al., 1995). Enzyme concentration was determined spectrophotometrically at 280 nm using an extinction coefficient (ϵ280) of 260,450 M-1 cm-1. Efavirenz was obtained from the National Institutes of Health AIDS Research and Reference Reagent Program. Both RNA and DNA oligonucleotides were synthesized by Integrated DNA Technologies (Coralville, IA). AZT-triphosphate (AZT-TP) was purchased from Sierra Bioresearch (Tuscon, AZ). All other reagents were of the highest quality available and were used without further purification. Template/Primer Substrates. All assays were carried out using a 26-nucleotide DNA primer (pr26, 5′-CCTGTTCGGGCGCCACTGCTAGAGAT-3′) annealed to either a 35-nucleotide RNA template (RNA-T, 5′-AGAAUGGAAAAUCUCUAGCAGUGGCGCCCGAA CAG-3′) or to a DNA template that was identical in sequence to the RNA template (DNA-T, 5′-AGAATGGAAAATCTCTAGCAGTGGCGCCCGAACAG-3′). The pr26 primer was chain-terminated with AZT-monophosphate (AZT-MP) to generate pr26-AZT, as described previously (Sluis-Cremer et al., 2005, 2007). Depending on the nature of the assay (described below), the 5′-end of the DNA primer or RNA template was radioactively labeled with [γ-32P]ATP (GE Healthcare, Piscataway, NJ). Efavirenz accelerates HIV-1 RT RNase H activity. A, autoradiogram of RNase H products generated during ATP-mediated excision assays in the absence and presence of efavirenz. Experiments were carried out as described under Materials and Methods; the 5′-end of the RNA template is radioactively labeled in these experiments. The primary RNase H cleavage events occur 17 or 18 nucleotides downstream from the polymerase active site, depending on the location of the AZT-MP moiety in the polymerase active site [17 nucleotides if in nucleotide (N)-site; 18 nucleotides if in priming (P)-site]. These cleavages generate RNA/DNA duplex lengths of 19 and 18 nucleotides, respectively. B, isotherm for the rate of appearance of the 19 nucleotide secondary RNase H cleavage product generated in the absence (•) or presence (○) of 150 nM efavirenz. The intensity of the 19 nucleotide product was determined by densitometric analyses using Bio-Rad GS525 Molecular Imager FX software and is reported as arbitrary units. C, isotherm for the rate of ATP-mediated AZT-MP excision carried-out by HIV-1 RT in the absence (•) or presence (○) of 150 nM efavirenz. Assays for Inhibition of AZT-TP Incorporation and AZT-MP Excision by HIV-1 RT. Inhibition of AZT-TP incorporation by efavirenz was determined using a fixed-time assay. In brief, 200 nM HIV-1 RT was preincubated with 20 nM T/P (RNA-T/pr26 or DNA-T/pr26) and varying concentrations of efavirenz (0-100 nM) in 50 mM Tris-HCl, pH 7.5 and 50 mM KCl at 37°C for 5 min. Reactions were initiated by the addition of 0.1, 1, or 10 μM AZT-TP and 10 mM MgCl2. Reactions were quenched after a defined time (15 s, 1 min, or 15 min) by the addition of an equal volume of sample loading buffer (98% deionized formamide, 10 mM EDTA, and 1 mg/ml each of bromphenol blue and xylene cyanol). Inhibition of AZT-MP excision by efavirenz was determined using both fixed-time and time-course assays. In brief, 200 nM HIV-1 RT was preincubated with 20 nM T/P (DNA-T/pr26-AZT or RNA-T/pr26-AZT) in 50 mM Tris-HCl, pH 7.5, and 50 mM KCl and varying concentrations of efavirenz (0-500 nM) at 37°C for 5 min. Reactions were initiated by the addition of 3 mM ATP and 10 mM MgCl2. Excision reactions carried out on the DNA-T/pr26-AZT and RNA-T/pr26-AZT were quenched with an equal volume of sample loading buffer after 30, 60, or 90 min, respectively. Reaction products were separated using denaturing polyacrylamide gel electrophoresis and analyzed by densitometry using a GS525 Molecular Imager FX (Bio-Rad Laboratories, Hercules, CA). Data analyses were carried-out using SigmaPlot 8.02 and/or SigmaStat 3.00 (Systat Software, Inc., San Jose, CA). Statistical significance was determined using the two-sample Student's t test. The results demonstrated that the IC50 values for efavirenz calculated at different AZT-TP concentrations (i.e., 0.1, 1.0 or 10 μM), or time points (15 s, 1 min or 15 min), were similar. Likewise, IC50 values calculated for AZT-MP excision from the fixed time assay (from different time points) or time course assays were also similar. Accordingly, for inhibition of AZT-TP incorporation data are reported from 1 min assays that contained 1.0 μM AZT-TP, and for inhibition of AZT-MP excision data are reported from a fixed time assay that was carried out for 30 min (Fig. 1). RNase H Assays. The effect of efavirenz on RNase H activity was evaluated using the RNA-T/pr26-AZT T/P that was used in the ATP-mediated excision assays described above. HIV-1 RT (200 nM) was preincubated with 20 nM T/P in 50 mM Tris-HCl, pH 7.5, and 50 mM KCl and varying concentrations of efavirenz (0 and 150 nM) at 37°C for 5 min. Reactions were initiated by the addition of 3 mM ATP and 10 mM MgCl2. Aliquots were removed and quenched at varying times and analyzed as described above. Gel Mobility Shift Assays. Gel mobility shift assays were used to evaluate the thermodynamics of RT-T/P interactions. In these assays, the amount of T/P-bound RT present in an equilibrium solution was assayed by native polyacrylamide gel electrophoresis. RT (0-10 μM total) was equilibrated with 100 nM T/P in 50 mM Tris-Cl, pH 7.5, and 50 mM KCl for 15 min as 37°C. Gels were run at room temperature for 30 min (100 V constant voltage) and quantified as described above. Discontinuity of sample and gel buffers can cause severe streaking of the bands. To correct for this, the area of the unshifted band was estimated from the lane containing DNA alone, and the area between shifted and unshifted bands was counted as the shifted band. The percentage of DNA-bound RT was calculated assuming that the amount of DNA in the shifted band represented a 1:1 complex of RT-T/P. excision of the NRTI zidovudine (AZT) in reactions carried out on DNA/DNA and RNA/DNA T/P that are identical in length and sequence. In this regard, previous detailed biochemical studies designed to delineate the molecular mechanism of synergy between NRTIs and NNRTIs measured inhibition of NRTI-MP excision on DNA/DNA T/P only (Basavapathruni et al., 2004). Other studies (Borkow et al., 1999; Odriozola et al., 2003) evaluated NNRTI-mediated inhibition of NRTI-MP excision on RNA/DNA T/P but did not provide a direct comparison with results obtained from complementary DNA/DNA T/P. Furthermore, none of these studies considered the possible effects of RNase H activity on the NRTI excision phenotype, despite ample evidence in the literature that this activity was modulated by NNRTI binding to RT (Gopalakrishnan and Benkovic, 1994; Palaniappan et al., 1995; Temiz and Bahar, 2002; Shaw-Reid et al., 2005; Hang et al., 2007). Ability of HIV-1 RT to incorporate or excise AZT on RNA/DNA T/P with decreasing duplex lengths. Sequences of RNA templates that were annealed to pr26 (for incorporation of AZT-TP) or pr26-AZT (for excision of AZT-MP) are shown. The RNA/DNA duplex length is highlighted in bold. Assays were carried out as described under Materials and Methods. Incorporation and excision activity on the RNA-T template was assumed as the reference (100%). Statistical difference is denoted as ** (p < 0.01) and *** (p < 0.001). To determine whether efavirenz differentially inhibited the incorporation and/or excision of AZT by HIV-1 RT on RNA/DNA and DNA/DNA T/P, IC50 values for these reactions were determined (Fig. 1). In all experiments described, the same DNA primer (pr26 or pr26-AZT) was annealed to DNA or RNA templates (RNA-T or DNA-T) that were identical in length and sequence (Fig. 1A). The IC50 values for efavirenz inhibition of AZT-TP incorporation by HIV-1 RT were calculated to be 19.6 ± 8.5 and 10.2 ± 4.0 nM for the DNA/DNA and RNA/DNA T/P, respectively (Fig. 1C). The small difference (∼1.9-fold) between these values was found to be statistically nonsignificant. By contrast, the IC50 values for efavirenz inhibition of AZT-MP excision by HIV-1 RT were calculated to be 108.1 ± 32.3 and 5.8 ± 1.1 nM for the DNA/DNA and RNA/DNA T/P, respectively (Fig. 1, B and C). The large (∼19-fold) difference between these values is statistically significant (p < 0.005). This large difference in IC50 value can not be explained by pre-existing large differences in the rates of AZT-MP excision from RNA/DNA or DNA/DNA T/P in the absence of drug (the apparent rates of AZT-MP excision were calculated to be 0.067 ± 0.005 min-1 and 0.045 ± 0.002 min-1 for DNA/DNA and RNA/DNA T/P, respectively) or by differences in apparent affinity of RT for the RNA/DNA and DNA/DNA T/P (Fig. 1D and 4A). Studies from the Anderson lab (Spence et al., 1995; Basavapathruni et al., 2004) and from ours (Xia et al., 2007) have demonstrated communication between the NNRTI-binding pocket and the DNA polymerase active site in HIV-1 RT, which accounts for the inhibition of RT-catalyzed nucleotide incorporation and excision reactions on a DNA/DNA T/P via a remote effect on the chemical step of these reactions. However, the data in Fig. 1 suggest that additional parameters may also contribute toward the ability of efavirenz to inhibit NRTI-MP excision on RNA/DNA T/P. Recent reports have suggested that the NRTI excision phenotype might also be influenced by the RNase H activity of RT (Nikolenko et al., 2005). In this regard, several studies have demonstrated that NNRTIs modulate the enzyme's RNase H activity. For example, both Shaw-Reid et al. (2005) and Hang et al. (2007) showed that this class of drugs can accelerate the enzyme's 3′ end-directed (or DNA polymerase-directed) RNase H activity. Accordingly, we were interested to assess the RNase H cleavage events that occurred during the AZT-MP excision reaction, and to delineate whether these affected the efficiency of the excision reaction. Figure 2 shows that efavirenz accelerates HIV-1 RT RNase H cleavage, data that is consistent with the results of the Shaw-Reid et al. (2005) and Hang et al. (2007) studies. Specifically, efavirenz increased the rate of appearance of a secondary RNase H cleavage event that reduced the RNA/DNA duplex length to 10 nucleotides (Fig. 2A). It is noteworthy that we also find an inverse relationship between the efficiency of AZT-MP excision and the appearance of this secondary RNase H cleavage event in time course assays carried out in the absence and presence of efavirenz (Fig. 2, B and C). Shaw-Reid et al. (2005) further suggested that the NNRTI (±)-4-(1-chloro-1,1-difluoromethyl)-4-(2-phenylethynyl)-6-chloro-2H-3,1-benzoxazin-2-one, an analog of efavirenz, in addition to accelerating the rate of RT RNase H activity also altered the specific RNase H cleavage pattern. However, this analysis was based on data from a single time point, and our data clearly show that the overall RNase H cleavage pattern of RT, including the primary and secondary cuts, was not affected by efavirenz (Fig. 2A). Mobility gel shift assays to assess RT-T/P interactions. A, representative gel for the binding of RT to RNA-T/pr26-AZT and DNA-T/pr26-AZT. Assays were carried out as described under Materials and Methods. The bound and free T/P substrates are labeled as RT-T/P-AZT and T/P-AZT, respectively. The concentrations of RT used in the assay are also indicated. B, plots of RT binding to the RNA/DNA T/P substrates with decreasing duplex lengths, as indicated in Fig. 3A. RNA/DNA T/P with duplex lengths of 26 nucleotides (•), 18 nucleotides (○), 16 nucleotides (▴), 14 nucleotides (▵), 12 nucleotides (▪), 10 nucleotides (□), 8 nucleotides (♦), and 6 nucleotides (⋄) are shown. To define the relationship between the efficiency of NRTI-MP excision and RNase H activity, we next evaluated the ability of HIV-1 RT to excise AZT-MP from a chain-terminated DNA primer that was annealed to different RNA templates that were recessed from the 3′ end, therefore incrementally decreasing the RNA/DNA duplex length (Fig. 3). 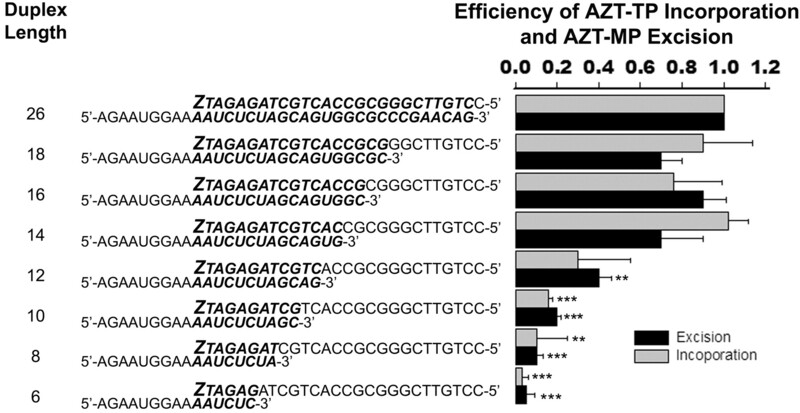 These data show that the efficiency of AZT-MP excision (and AZT-TP incorporation) was severely compromised when the RNA/DNA duplex length was decreased to 12 nucleotides or less (Fig. 3). If the RNA/DNA duplex was reduced to 10 nucleotides - a duplex length consistent with the secondary RNase H cleavage event described in Fig. 2—RT was essentially unable to carry-out ATP-mediated AZT-MP excision. Gel mobility shift assays demonstrate that RT exhibited a decrease in affinity for the RNA/DNA T/P each time the duplex length was decreased (Fig. 4). This decrease in RT-T/P affinity provides a plausible explanation for the observed decrease in the efficiency of AZT-MP excision (Fig. 3). Taken together, these results provide convincing evidence that the sensitivity of the AZT-MP excision reaction on RNA/DNA T/P to efavirenz may be explained by the drug-induced accelerated RNase H activity of the enzyme in addition to effects on the chemistry step of the AZT-MP excision reaction. Our data also show that AZT-TP incorporation is affected by decreasing the RNA/DNA duplex length (Fig. 3). However, the rate of AZT-TP incorporation is significantly faster than the rate of AZT-MP excision, (8.78 s-1 versus 0.54 × 10-3 s-1; Sluis-Cremer et al., 2005) and therefore we would not expect the observed increase in the secondary cleavage event that accumulates in a minute time-scale (see Fig. 2) to adversely affect the IC50 for incorporation of AZT-TP. Nikolenko et al. (2005) recently proposed that an equilibrium exists between 1) NRTI incorporation, NRTI excision, and resumption of DNA synthesis and 2) degradation of the RNA template by RNase H activity that leads to dissociation of the template-primer and abrogation of HIV-1 replication. 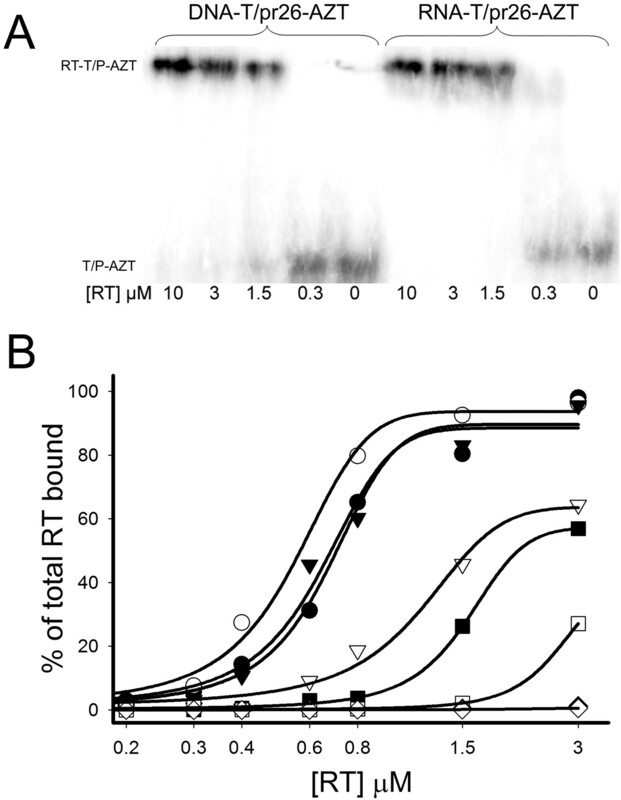 In this regard, the authors elegantly showed that mutations in the RNase H domain of RT that reduce RT RNase H activity confer AZT resistance. Our study lends biochemical support to this model and clearly demonstrates that the efficiency of ATP-mediated excision reactions on RNA/DNA templates can be influenced by the enzyme's RNase H activity. However, the data in Fig. 3 show that it is not a decrease in the absolute rate of RNase H activity that will contribute to increased NRTI-MP excision, but a decrease in the rate or appearance of secondary cleavage events that generate RNA/DNA T/P with duplexes less than 13 nucleotides. This study was supported by National Institutes of Health grant R01-GM068406-01. Basavapathruni A, Bailey CM, and Anderson KS (2004) Defining a molecular mechanism of synergy between nucleoside and nonnucleoside AIDS drugs. J Biol Chem 279: 6221-6224. Borkow G, Arion D, Wainberg MA, and Parniak MA (1999) The thiocarboxanilide nonnucleoside inhibitor UC781 restores antiviral activity of 3′-azido-3′-deoxythymidine (AZT) against AZT-resistant human immunodeficiency virus type 1. Antimicrob Agents Chemother 43: 259-263. Chong KT, Pagano PJ, and Hinshaw RR (1994) Bisheteroarylpiperazine reverse transcriptase inhibitor in combination with 3′-azido-3′-deoxythymidine or 2′,3′-dideoxycytidine synergistically inhibits human immunodeficiency virus type 1 replication in vitro. Antimicrob Agents Chemother 38: 288-293. Cruchaga C, Odriozola L, Andreola M, Tarrago-Litvak L, and Martinez-Irujo JJ (2005) Inhibition of phosphorolysis catalyzed by HIV-1 reverse transcriptase is responsible for the synergy found in combinations of 3′-azido-3′-deoxythymidine with nonnucleoside inhibitors. Biochemistry 44: 3535-3546. Gopalakrishnan V and Benkovic S (1994) Effect of a thiobenzimidazolone derivative on DNA strand transfer catalyzed by HIV-1 reverse transcriptase. J Biol Chem 269: 4110-4115. Hammer SM, Saag MS, Schechter M, Montaner JS, Schooley RT, Jacobsen DM, Thompson MA, Carpenter CC, Fischl MA, Gazzard BG, et al. (2006) Treatment for adult HIV infection: 2006 recommendations of the International AIDS Society-USA panel. JAMA 296: 827-843. Hang JQ, Li Y, Yang Y, Cammack N, Mirzadegan T, and Klumpp K (2007) Substrate-dependent inhibition or stimulation of HIV RNase H activity by non-nucleoside reverse transcriptase inhibitors (NNRTIs). Biochem Biophys Res Commun 352: 341-350. King RW, Klabe RM, Reid CD, and Erickson-Viitanen SK (2002) Potency of non-nucleoside reverse transcriptase inhibitors (NNRTIs) used in combination with other human immunodeficiency virus NNRTIs, NRTIs, or protease inhibitors. Antimicrob Agents Chemother 46: 1640-1646. Le Grice SF, Cameron CE, and Benkovic SJ (1995) Purification and characterization of human immunodeficiency virus type 1 reverse transcriptase. Methods Enzymol 262: 130-144. Maga G, Ubiali D, Salvetti R, Pregnolato M, and Spadari S (2000) Selective interaction of the human immunodeficiency virus type 1 reverse transcriptase non-nucleoside inhibitor efavirenz and its thio-substituted analog with different enzyme-substrate complexes. Antimicrob Agents Chemother 44: 1186-1194. Merrill DP, Moonis M, Chou TC, and Hirsch MS (1996) Lamivudine or stavudine in two- and three-drug combinations against human immunodeficiency virus type 1 replication in vitro. J Infect Dis 173: 355-364. Nikolenko GN, Palmer S, Maldarelli F, Mellors JW, Coffin JM, and Pathak VK (2005) Mechanism for nucleoside analog-mediated abrogation of HIV-1 replication: balance between RNase H activity and nucleotide excision. Proc Natl Acad Sci U S A 102: 2093-2098. Odriozola L, Cruchaga C, Andreola M, Dolle V, Nguyen CH, Tarrago-Litvak L, Perez-Mediavilla A, and Martinez-Irujo JJ (2003) Non-nucleoside inhibitors of HIV-1 reverse transcriptase inhibit phosphorolysis and resensitize the 3′-azido-3′-deoxythymidine (AZT)-resistant polymerase to AZT-5′-triphosphate. J Biol Chem 278: 42710-42716. Palaniappan C, Fay PJ, and Bambara RA (1995) Nevirapine alters the cleavage specificity of ribonuclease H of human immunodeficiency virus 1 reverse transcriptase. J Biol Chem 270: 4861-4869. Pauwels R, Andries K, Debyser Z, Kukla MJ, Schols D, Breslin HJ, Woestenborghs R, Desmyter J, Janssen MA, De Clercq E, et al. (1994) New tetrahydroimidazo[4,5,1-jk][1,4]-benzodiazepin-2(1H)-one and -thione derivatives are potent inhibitors of human immunodeficiency virus type 1 replication and are synergistic with 2′,3′-dideoxynucleoside analogs. Antimicrob Agents Chemother 38: 2863-2870. Richman D, Rosenthal AS, Skoog M, Eckner RJ, Chou TC, Sabo JP, and Merluzzi VJ (1991) BI-RG-587 is active against zidovudine-resistant human immunodeficiency virus type 1 and synergistic with zidovudine. Antimicrob Agents Chemother 35: 305-308. Shaw-Reid CA, Feuston B, Munshi V, Getty K, Krueger J, Hazuda DJ, Parniak MA, Miller MD, and Lewis D (2005) Dissecting the effects of DNA polymerase and ribonuclease H inhibitor combinations on HIV-1 reverse-transcriptase activities. Biochemistry 44: 1595-1606. Sluis-Cremer N, Arion D, Parikh U, Koontz D, Schinazi RF, Mellors JW, and Parniak MA (2005) The 3′-azido group is not the primary determinant of 3′-azido-3′-deoxythymidine (AZT) responsible for the excision phenotype of AZT-resistant HIV-1. J Biol Chem 280: 29047-29052. Sluis-Cremer N, Sheen CW, Zelina S, Torres PS, Parikh UM, and Mellors JW (2007) Molecular mechanism by which the K70E mutation in human immunodeficiency virus type 1 reverse transcriptase confers resistance to nucleoside reverse transcriptase inhibitors. Antimicrob Agents Chemother 51: 48-53. Spence RA, Kati WM, Anderson KS, and Johnson KA (1995) Mechanism of inhibition of HIV-1 reverse transcriptase by nonnucleoside inhibitors. Science 267: 988-993. Temiz NA and Bahar I (2002) Inhibitor binding alters the directions of domain motions in HIV-1 reverse transcriptase. Proteins 49: 61-70. Xia Q, Radzio J, Anderson KS, and Sluis-Cremer N (2007) Probing nonnucleoside inhibitor induced active site distortion in HIV-1 reverse transcriptase by transient kinetic analyses. Protein Sci 16: 1728-1737.